I love this table So chic and perfect for my living room. Everyone compliments it. It is not too big but big enough. I have it set next to the couch and its perfect. Safavieh Winery 3-piece Counter-Height Brown Storage Pub Set - 36" x 36" x 36"
Get the perfect table for two, no reservations required. The Safavieh Winery pub set fits neatly into small spaces and folds away with two drop leaves when not in use. Two stools with foot rests complete the set and fit neatly under the table for storage. Constructed of solid Malaysian oak wood and finished in a rich espresso color, this counter-height set is easy to clean and maintain. The clean lines of this set are at home in traditional as well modern room designs. Welcome a new day or end it elegantly with this versatile pub set. Dimensions Table 36 in. H. x 36 in. W. x 36 in D., Stool 24 in. H. x 17.5 in. W. x 11.8 in D.
When I ordered the item, the picture was of a pub-height table with a 9 bottle wine rack underneath (hence the use of the word Winery in the title). Then I got shipped a pub height parson's table. Customer service said the item was updated after I ordered and that the table I was sent was the correct one, the original picture was off (the item # on the box of the table I was sent did NOT match the item # of the one I ordered). 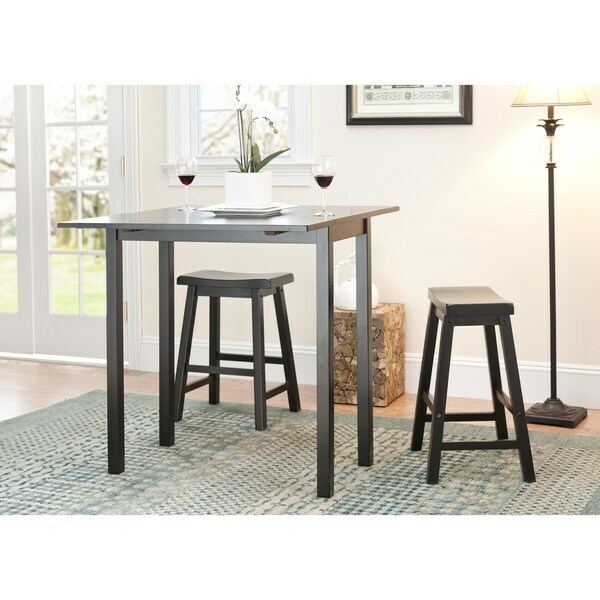 However, now another "Winery 3-piece counter-height pub set" has been posted on the website with the picture of what I thought I'd be getting. But there is also the same description with a picture of the Parsons table (the incorrect one). So just be forewarned, you may not get what you ordered. On a positive note, the wood looked to be of good quality. Customer service did do a good job of processing a full return for me and since the item was incorrect Overstock covered the return shipping. This set is very similar to a set that can be purchased at ***. I was hoping to get a little higher quality through Overstock but didn't. One of the screws in the tabletop was poking through slighlty when I got it but it was too much effort to return so we kept the set. We have just remodeled our kitchen. We were looking for a smaller table. This counter height pub set is perfect! The leaves make it very veristile. The stools are the perfect height. I love this little table. I have a small kitchen and this little drop down table is sturdy and stable and really nice to look at. It was easy to assemble. This has been the perfect little table for my small apartment kitchen and now for my small-ish house kitchen. I did add felt feet to the bottom of the chairs to keep them from scratching my wood floors, and it would have been nice if these had been included. It was easy to assemble. The stools are very hard to put together with the tools provided, but the table was a breeze. You'll need a ratchet to get the stools done. The table top wood is pretty thin, so it's a bit flimsy, but it is certainly good for a small space. Stools are mega uncomfortable. I needed a writing area for my newly remodeled office, but didn't want just a desk. This drop down table, was a perfect fit. I bought a piece of glass (middle section only) to keep for getting pen scratches in it and it works wonderfully. Great price. Easy to assemble and top quality materials! With both leafs up it makes a nice dinner table for our 4 grandchrildren. Great use of space in our small apartment and the stools are very comfortable to sit on. It is a little wobbly, but manageable. "What's the measurement of the table when both leaves are broken down"
We are still researching this and should have the answer shortly. Hello jinxlatty, the measurements when broken down are 36 inches x 19 inches. Thanks for shopping with us! Safavieh Haley Grey 4-piece Pub Set - 25" x 45" x 37"